In the first two articles in this series on creating DAX formulae, Andy Brown of Wise Owl Training showed how to create calculated columns and measures. In this third article, he turns his attention to two of the most important DAX functions (CALCULATE and VALUES), showing how and when to use them. If DAX knowledge can be compared to a heavily fortified castle, the CALCULATE function is the drawbridge giving access to it. If you should ever start reading a book on DAX, you will quickly reach a chapter on the CALCULATE function. The book will tell you that the CALCULATE function is at the heart of everything that you do in DAX and is the key to understanding the language. A delegate on one of my courses adopted the policy of starting every formula with =CALCULATE, and it’s not such a bad approach! This article explains how to use the CALCULATE function and also how to use the (almost) equally important VALUES function. 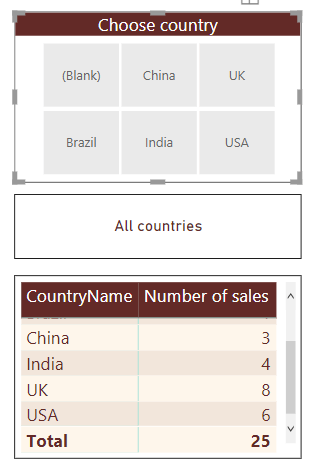 You can import this data into your own Power BI data model by first downloading this Excel workbook, or by running this SQL script in SQL Server Management Studio. 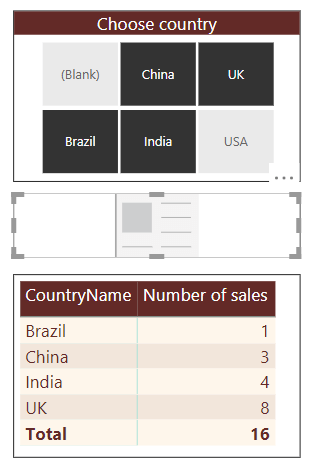 As for the previous articles in this series, everything I describe below will work just as well in Power BI, PowerPivot or Analysis Services (Tabular Model), each of which Wise Owl train. To understand the CALCULATE function, you must understand filter context, so that’s where I’ll begin for this article. These are the three sales which took place for this product in this country and city. 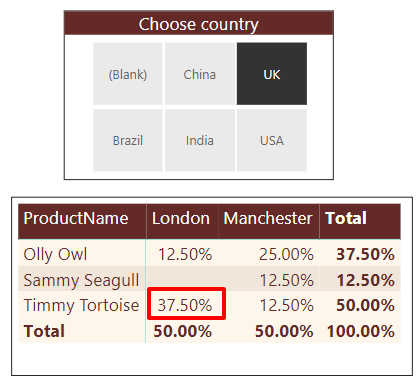 This gives 75% because this is the result you get when you divide 3 (the number of sales in London for Timmy Tortoise) by 4 (the number of sales in London for all products). Note that I’ll often refer in this article to the numerator and denominator. In any fraction A / B, the numerator is A and the denominator is B (but you knew that from school maths, didn’t you?). 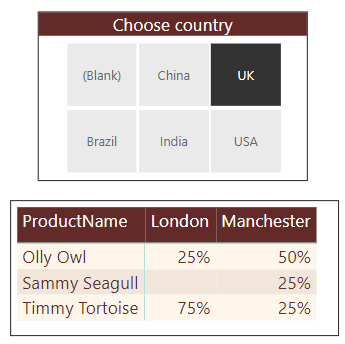 The figures are exactly the same, and for Timmy Tortoise for London you’ll see 75% because this is the ratio between the number of sales for this product and city (3) against the number of sales for all products and this city (4). The figures in the bottom row make sense: total sales for London for all products divided by total sales for London for all products will always give 100%! You can use the ALL function as many times as you like – each time it will remove one dimension from the filter context. It’s up to you whether you think it’s more elegant to remove constraints from the filter context individually using ALL, or to remove all constraints apart from one using ALLEXCEPT. 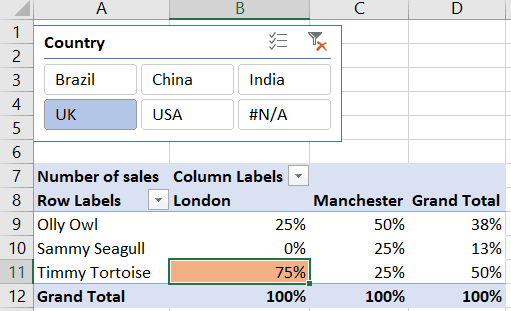 For this example, it’s inevitable that the figures for Timmy Tortoise should be 100%, because for each cell in this row you’re dividing a figure by itself. The matrix above shows that sales of Olly Owl were only a third of those for Timmy Tortoise in London but were twice those for Timmy Tortoise in Manchester. 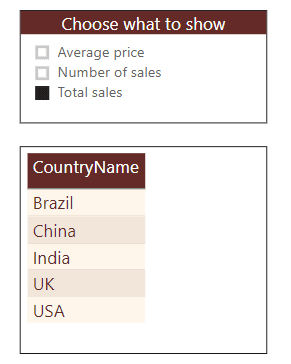 What this does is to calculate the number of sales for a particular country, city and product, and divide this by the number of sales for the same country and city, but for Timmy Tortoise. The extra filter you add in the CALCULATE formula doesn’t build on the filter context for the product, but instead replaces it. 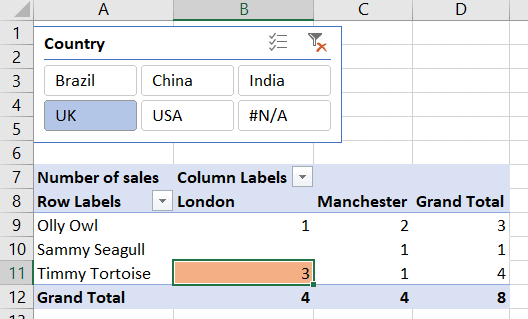 The second formula gives the total sales value for the current filter context, with no extra modifications to it. The first formula gives the same result for each row. 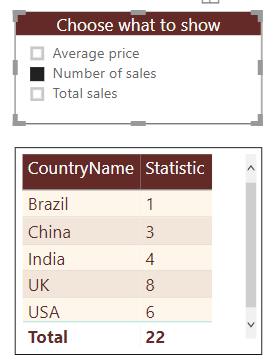 Because calculated columns don’t have a filter context by default, the formula sums sales over all of the rows in the sales table, giving the same answer (238.32) for each. The CALCULATE function doesn’t just allow you to change the filter context, it can create it, too. 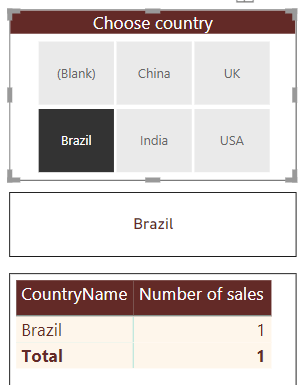 For each country, this creates a filter context, limiting the rows in the sales table to those for the country in question, and hence giving a different answer for each row of the above table. The process of changing row context into filter context in this way is called context transition. Learning the CALCULATE function is key to understanding how to create measures in DAX, but the VALUES function runs it a close second. 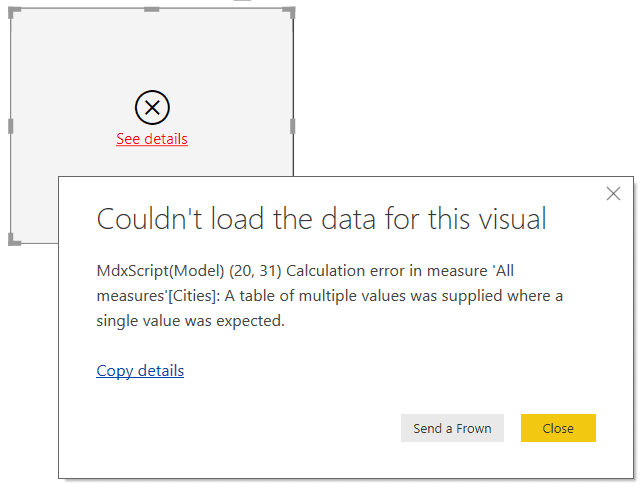 The rest of this article shows what this function does, and how to use it to create a range of effects in your Power BI reports. The problem is that you’re trying to display a column of values in a single cell. 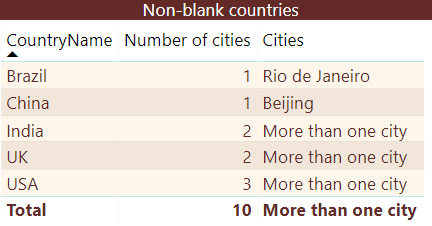 This would work for Brazil and China, each of which only has one city, but wouldn’t work for the other three countries. 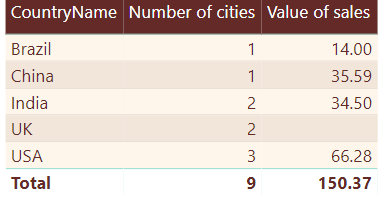 For the total row there are lots of cities in the current filter context, so naturally you get the More than one city message. This is because the VALUES function returns a column of data, and even though you know that there is only one row in this column, and hence only one value, you would normally still need to apply some aggregation function (e.g., MAX, MIN, SUM) to the data. Happily, there is one exception to this rule. 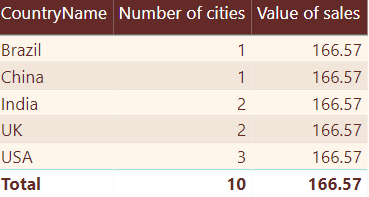 If a call to the VALUES function returns a table with one column and one row, you can automatically treat this as a single scalar value without any additional work. This is why this measure works! 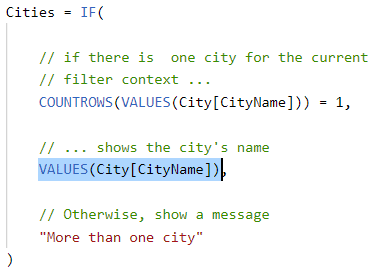 Checking whether the filter context only contains one value for a particular column is a common thing to do. It’s so common, in fact, that DAX has a dedicated function called HASONEVALUE to do this. These three methods, using VALUES, HASONEVALUE or DISTINCTCOUNT, are interchangeable, and I don’t think there’s any clear reason to favour one over another. 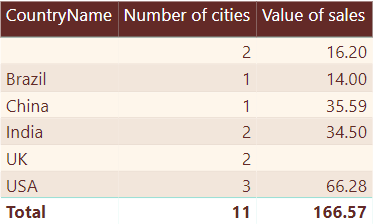 The column in this table containing the values to concatenate. 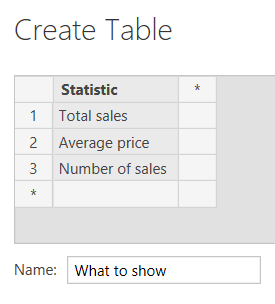 You have to specify this even if the table only has one column, even though in this case it is blindingly obvious that this is the one you should choose! Which column you want to order by. Again you need to specify this, even if you know you’re working with a single-column table. All of this illustrates an important point about DAX measures. You can create a measure which gives sensible results for one particular visual, but can you be sure that it will give sensible results in another? Or in a totals row? Or a totals column, or grand total? You’ll often be faced with a trade-off in DAX between checking that a measure works under all possible circumstances and keeping things simple. 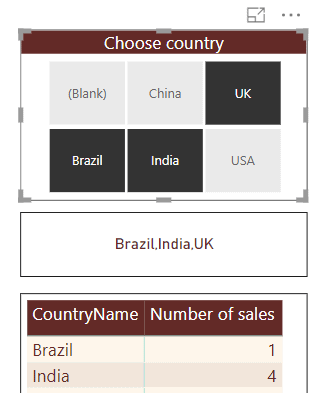 Add these 16.20 of sales in as above and you would get the required figure. 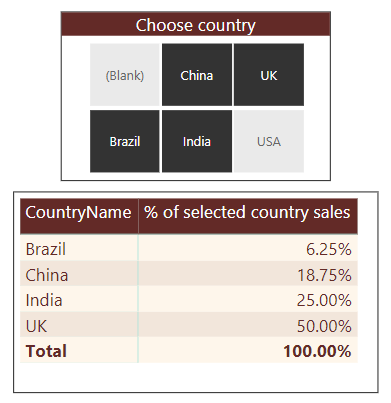 A blank if someone selects more than one statistic at a time or doesn’t select one at all. Here’s what this measure might look like! And just in case you’re wondering, I can’t think of any way to change the column title dynamically! 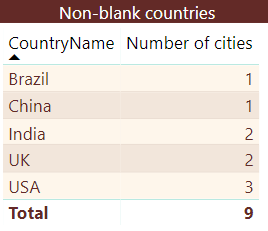 If you want to be even fancier you could use a quick measure to display only the first 3 countries in any list which I covered in the previous article in this series. This article has shown how you can use two of the most important DAX functions: CALCULATE and VALUES. 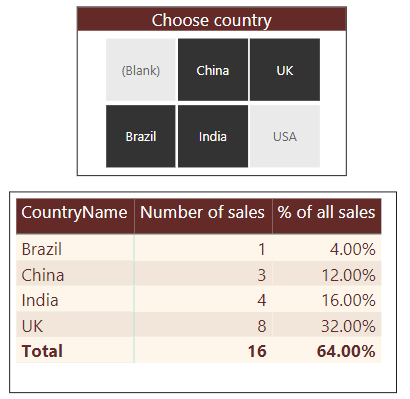 The article began by showing how you can use the CALCULATE function to amend the default filter context, mainly in order to create ratios. I then showed how you can use functions like VALUES, HASONEVALUE and ISFILTERED to produce a variety of clever effects in DAX. The next article in this series will look at the FILTER and EARLIER functions. You should make sure that you understand clearly how you can use the CALCULATE function to change filter context before progressing, since the DAX formulae won’t get any easier! 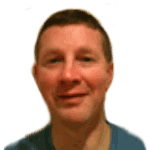 Andy works as a trainer and consultant for Wise Owl Training, providing SQL Server, .NET, Visual Basic and (reluctantly!) C# training for businesses in the UK. Hey Andy, great article! One question, and a nagging concern about DAX, at the end of the Calculate section you speak about how the Calculate function can create its own filter context. 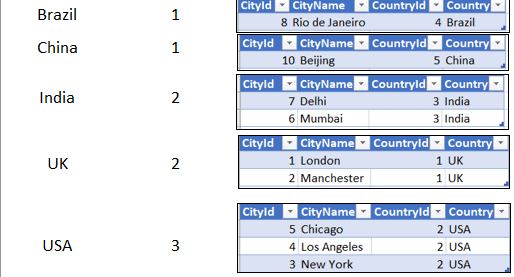 In the example you show two columns. 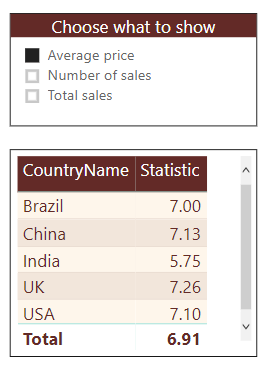 Column A shows the same total for each country, 238.32. Column B totals to 222.12. When the underlying data is the same, why is there a difference? There’s 16.20 left unaccounted for. This is explained in the text – I’ve just checked!